SELLER WILLING TO SPLIT INTO 5 ACRES PARCELS LOADED WITH VALUABLE PALMS TREES. FRONT PARCELS $80,000.00 / BACK PARCELS $75,000.00 UNIQUE OPPORTUNITY !! SPECTACULAR LOT WITH INVENTORY OF DIVERSE PALM TREES, UNDERGROUND ELECTRIC WIRING, DRAIN DITCHES. LOT HAS TWO WATER WELLS. Enjoy the quiet and tranquility while you are watching the wildlife. Perfect for horses, cows and goats. 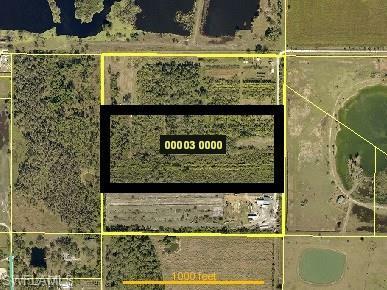 Property is located in desirable North Fort Myers area with private road access.BUILD YOUR DREAM HOME OR DIVIDE IT IN PARCELS.The total tax bill amount reflects the total lot size of 40 acres and not this listing's lot size of 19.4 acres. Listing courtesy of Enrique Pedraza of Innova Real Estate Corp.